Tragedy has a way of bringing out demagoguery. This has been especially true in the weeks since 19-year-old Nikolas Cruz went on a murderous rampage in Marjorie Stoneman Douglas High School in Parkland, Fla., and took the lives of 17 young men and women who should be sitting in classrooms today. This includes the Occupant of the White House and others calling for laws allowing teachers and other adults in schools to carry firearms into classrooms, an idea that ignores the obstacles to that being effective under any circumstances and would increase the violence to which Black and Brown children are already subjected. Once of the demagogic arguments emerging from the Parkland massacre is one being perpetuated is the idea that Cruz’s rampage would have been stemmed if not for efforts encouraged by the Obama Administration to stem the overuse of harsh school discipline — including the presence of cops patrolling the corridors of public schools. As argued by less-reputable outlets and conservative writers such as Breitbart and Ann Coulter as well as supposedly respectable types such as Manhattan Institute’s Max Eden (based mostly off a clip job of a Washington Post article) and (with a little more reason) David French of National Review, if the Broward district, as part of its PROMISE school discipline reform initiative, didn’t team up with the county’s sheriff to reduce the number of students being arrested for minor offenses, Cruz would have been arrested and kept from doing harm to his former schoolmates. Particularly for Eden, the Parkland massacre is another way to oppose school discipline reforms happening throughout the country, as well as overturn the Obama Administration-era guidance advising districts to not overuse suspensions and other discipline, especially against poor and minority children. Of course, this isn’t shocking; Eden will engage in any kind of sophistry and data fudging to advance his cause. The problem, as you can expect, is that this line of argument doesn’t stand up to these rather demonstrable facts. The first, as the Washington Post notes, is that Broward did plenty when it came to Cruz and his issues. This includes twice transferring him to an alternative high school, Cross Creek, after his behavioral issues became too difficult for teachers and school leaders to handle, as well as referring the young man to Florida’s child welfare agency after a fight during the 2016-2017 school year; the child welfare agency determined that he was of little risk to himself or to those around him. Some would say that Cruz’s case illustrates the crucial need for schools to provide mental health care, a subject of earlier Dropout Nation commentaries, as well as the general social need to do better in providing community mental health care. Others may say it demonstrates the failure of social service agencies in identifying those who endanger others as well as themselves. Both may be true. At the same time, based on the evidence, the real issue seems to lie with state laws that make it all too easy for anyone to obtain a firearm. The second: That Broward County still arrests and refers thousands of children to juvenile and criminal justice systems. Twenty-two hundred sixty-eight students were arrested or referred during the 2015-2016 school year, according to data from the Florida Department of Education. While that number is two-thirds lower than arrests and incidents in 2009-2010, the numbers have remained constant since 2011-2012. The presence of cops in schools hasn’t led to greater safety for children. This is because crime in schools has been in decline for three decades. What their presence has done is caused harm, physical and otherwise, to youth such as Noe Nino de Rivera. What has changed is that Broward is less likely to have children arrested and referred for incidents that can be handled within schools. Crimes that should be handled by cops such as battery, sexual assault, drug possession and weapons possession accounted for 64.4 percent of arrests and referrals in 2015-2016 versus 47.4 percent in 2009-2010. Other incidents traditionally handled by schools are, well, being handled by them. This includes fighting, which now accounts for 8.9 percent of referrals versus 27.6 percent of them six years ago. This has resulted in Broward reducing the number of children put on the path to prison overall, an effort that, by the way, predate the implementation of the district’s PROMISE program; referrals declined by 64 percent between 2009-2010 and 2010-2011. This is especially true when it comes to poor and minority children who made up the majority of children arrested and referred according to data submitted by Broward to the federal government. The number of Black children in regular classrooms arrested and referred, for example, declined by two-thirds between 2009-2010 and 2013-2014 (from 3,835 to 1,011), while the rate of arrest and referral declined from 3.8 percent to 1 percent in that same period. [The percentage of White children arrested and referred declined from 1.3 percent to four-tenths of one percent in that same period, with a two-thirds decline in the numbers (from 920 to 267) in that time period.] Overall, the number of Broward children in regular classrooms arrested and referred declined by 70.5 percent (from 6,050 to 1,786) in that period. Which leads to a third fact: For all that Broward is doing, it is still condemning far too many children to juvenile and criminal justice systems. “Disruption on campus”, a catch-all term that covers plenty of non-violent and minor behaviors now account for 18.7 percent of referrals versus a mere 7.9 percent in 2009-2010. This is way too high. Black children still account for 57.8 of students arrested and referred despite accounting for just 39.6 percent of enrollment. Given that Cruz himself was considered a White student, he was far less likely than his Black former peers to be arrested or referred to law enforcement. This problem extends to other forms of harsh discipline. While Broward meted out one or more suspensions by 61.6 percent between 2009-2010 and 2013-2014, the number of suspensions meted out against Black children increased by 43.6 percent (from 1,490 to 2,139). Even worse, Black students account for 62.6 percent of out-of-school suspensions meted out in 2013-2014, versus 16.7 percent of suspensions four years earlier. Finally, contrary to the assertions of these demagogues (as well as the views of many opponents of reforming school discipline), the reality is that the presence of cops in schools does nothing to make them safer. The body of research was clear even before the Parkland massacre, in which a Broward County sheriff’s deputy patrolling the premises didn’t take on Cruz when he began shooting up the school. As Dropout Nation detailed over the past few years, more districts, especially those in big cities, are launching their own police agencies even as youth crime has been on a three decade-long decline. Between 1996 and 2008, the number of districts operating police departments more than doubled (from 117 to 250), according to the U.S. Bureau of Justice Statistics. Districts are also bringing in more cops from police departments. The number of cops in schools increased by 38 percent between 1997 and 2007; today, 43 percent of America’s schools (including 42 percent of high schools and another 23 percent of elementary schools where children younger than 12 are supposed to be learning) are patrolled by some form of law enforcement. Yet as the Justice Policy Institute notes in a report released in 2011, there is no evidence that increased presence of law enforcement in schools leads to safer schools. If anything, the presence of cops in schools all but ensures that children will be arrested and referred to juvenile and criminal justice systems. As University of Florida Professor Jason Nance determined in a 2016 study, the increased presence of police in schools always leads to more children and teens being arrested, even after controlling for demographics and levels of crime in surrounding communities. Those arrests, in turn, are often for minor infractions that are better-handled by teachers and school leaders. In Birmingham, Ala., for example, 86 percent of students arrested in 2009-2010 were picked up for disruptive behavior and other issues that would usually be handled in schools. Even worse, poor and minority children, along with those condemned to the nation’s special education ghettos, are the ones most-likely to be targeted by cops. Black children, for example, were 2.2 times more-likely to be arrested or referred to juvenile and criminal justice systems than White peers in 2013-2014, according to data from the U.S. Department of Education; youth in special ed accounted for 26 percent of arrests and referrals in 2012-2013, according to Center for Public Integrity in its analysis. Meanwhile in South Carolina, Black children accounted for 70.9 percent of the arrests and referrals to juvenile justice for the catch-all of “disturbing schools” in 2014-2015, according to the American Civil Liberties Union; this is despite the fact that Black children make up little more than a third of all children in the state’s public education system. Meanwhile the presence of cops also leads to children being assaulted and abused by them. 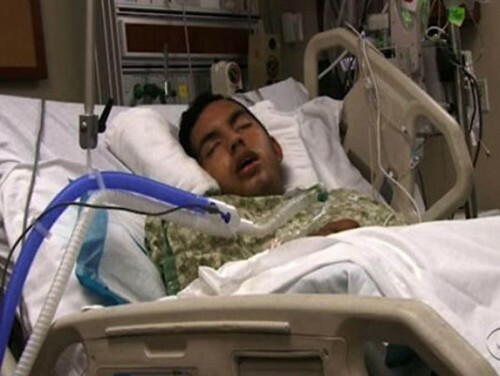 From the 110 incidents of pepper-spraying of children by cops patrolling the schools of the Birmingham, Ala., district , to the permanent injuring of Noe Nino de Rivera, a 17-year-old junior Cedar Creek High School in Bastrop County, Texas, who ended up in a coma for a full year after an officer tased him, there are far too many instances of cops harming children. As the Bureau of Justice Statistics’ detailed in its own analysis, school cops are often poorly trained to address problems in schools, and therefore, unfit to handle minor issues that teachers and school leaders can address in less-physically harmful ways. We need fewer cops in schools, not more. Put simply, contrary to what conservatives and opponents of school discipline reform want to think, rare mass shootings such as the Parkland Massacre won’t be solved by the presence of more cops and harsher discipline. Of course, if those folks (especially Coulter and Eden) actually cared about children, they wouldn’t suggest this in the first place. Or use tragedy as grist for their mills of demagoguery.